Urban centres are bastions of inequalities, where poverty, marginalization, segregation and health insecurity are magnified. Minorities and the poor – often residing in neighbourhoods characterized by degraded infrastructures, food and job insecurity, limited access to transport and health care, and other inadequate public services – are inherently vulnerable, especially at risk in times of shock or change as they lack the option to avoid, mitigate and adapt to threats. Offering both theoretical and practical approaches, this book proposes critical perspectives and an interdisciplinary lens on urban inequalities in light of individual, group, community and system vulnerabilities and resilience. Touching upon current research trends in food justice, environmental injustice through socio-spatial tactics and solution-based approaches towards urban community resilience, Resilience, Environmental Justice and the City promotes perspectives which transition away from the traditional discussions surrounding environmental justice and pinpoints the need to address urban social inequalities beyond the build environment, championing approaches that help embed social vulnerabilities and resilience in urban planning. 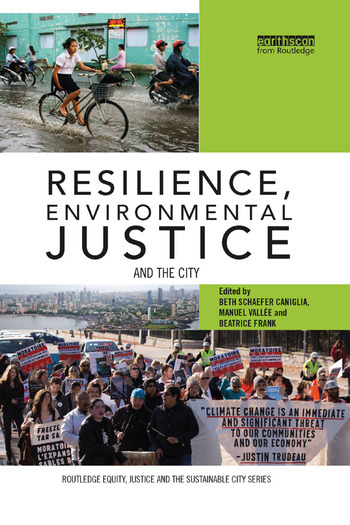 With its methodological and dynamic approach to the intertwined nature of resilience and environmental justice in urban cities, this book will be of great interest to students, scholars and practitioners within urban studies, environmental management, environmental sociology and public administration. Beth Schaefer Caniglia is the Director of the Sustainable Economic & Enterprise Development (SEED) Institute and Faculty Research Director in the College of Business and Economics at Regis University, USA. Manuel Vallée is a lecturer in the Department of Sociology at the University of Auckland, New Zealand. Beatrice Frank is the Social Science Specialist of Regional Parks, Capital Regional District of Victoria, Canada.